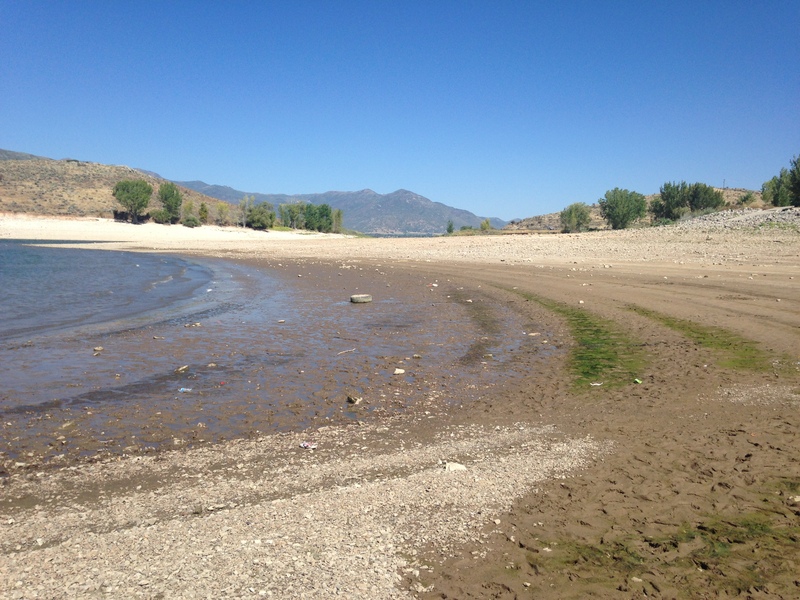 The Wasatch County Health Department has lifted the HAB Warning Advisory at Deer Creek Reservoir. Health officials visited the reservoir on November 20, 2018, and found no evidence of cyanobacteria at either Rainbow Bay or the Island Resort area. Advisory signs have been removed from those areas. The Division of Water Quality (DWQ) collected samples at three sites at Deer Creek Reservoir on October 18, 2018. Toxin test results were non-detect for anatoxin-a at Island Park, the only site tested for anatoxin-a. Microcystin levels at all three sample sites, however, exceeded the recreation health-based threshold for a Warning Advisory. While cyanobacteria cell-count concentrations were low at Island Park, microcystins levels were high at all sample sites. Test results showed the toxins were distributed throughout the water column. Low cell counts combined with high toxin levels could indicate that the bloom is decaying and releasing toxins as a result. Local health department officials continue to observe the midday accumulation of bloom materials along the shorelines at Island Resort and Rainbow Bay. 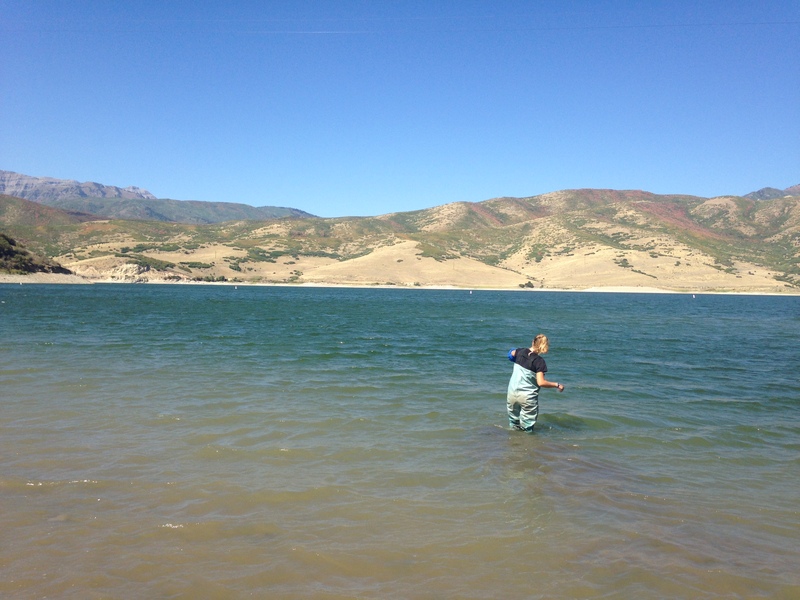 Utah Department of Agriculture (UDAF) lab results for Deer Creek Reservoir samples ranged from 40 micrograms per liter (µg/L)(10x dilution) of microcystin at Rainbow Bay to >50 µg/L (10x dilution) of microcystin at the other two sites. Further dilutions by the lab will be necessary to quantify microcystin concentrations, and preliminary values could go even higher after these dilutions. The Warning Advisory for Island Park and Rainbow Bay at Deer Creek Reservoir remains in effect. The Island Park sample was the only sample submitted to the lab. Cyanobacteria cell-count densities at this site were 15,108 cells per milliliter (cells/ml), which is below the threshold for a Warning Advisory. The Utah Public Health Lab (UPHL) performed additional dilutions on a sample collected from Deer Creek Reservoir on September 18, 2018. Final toxin results from the Rainbow Bay sample showed microcystin levels of 160 micrograms per liter (µg/L) after 100x dilution. The Division of Water Quality (DWQ) received toxin test results for a sample collected at Rainbow Bay on September 18, 2018. Utah Department of Agriculture and Food (UDAF) lab results showed microcystin levels >100 micrograms per liter (µg/L) after 20x dilution. Further dilutions by the lab will be necessary to quantify microcystin concentrations, and the preliminary values could go even higher after these dilutions. The Wasatch County Health Department (WCHD) posted Warning Advisory signs at the entrances to Island Resort and Rainbow Bay today based on toxin strip-tests and enzyme-linked immunosorbent assay (ELISA) testing of samples from these two locations. Signs were modified to explain that cyanobacteria are accumulated along the shoreline and not dispersed throughout the reservoir. Wind and wave action at the reservoir in the early afternoon appear to disperse blooms that accumulate along the shoreline in the morning. The Division of Water Quality (DWQ) and WCHD visited Deer Creek Reservoir on September 18, 2018, to conduct follow-up monitoring. DWQ and WCHD visited three sites on the reservoir. They observed a bloom along the shore on the surface of the water at the Rainbow Bay monitoring location. The bloom was consolidated along the shore, but appeared to be evenly distributed through the water column further out into the reservoir. Wave action from wind and boating appeared to consolidate the bloom along the shore. DWQ collected surface samples at this site. 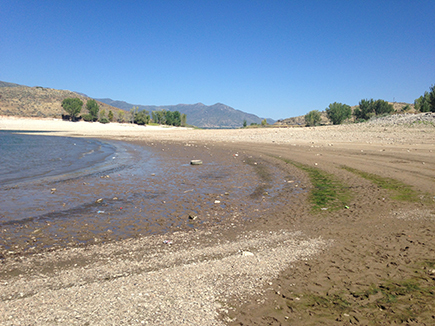 An isolated cyanobacteria bloom that resembled grass clippings was observed near the southern boat launch, but it was dispersed and isolated. No bloom was observed in the water at the Island Park Marina monitoring location; however, evidence of a past bloom was observed along the shore. 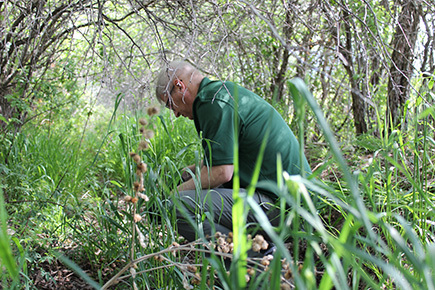 The Central Utah Water Conservancy District (CUWCD) visited the reservoir on September 19, 2018, and collected samples at Island Resort and several other locations. Unlike the previous day, the Island Resort area showed a pronounced bloom. ELISA testing for the Island Resort sample showed microcystin levels of 4,890 micrograms per liter (µg/L), over twice the level suggested for a Danger Advisory. However, the area below the dam, the drinking-water treatment plant influent, and finished water all tested non-detect for microcystin. WCHD visited both locations on September 20, 2018, and observed an accumulation of cyanobacteria along the beach from the island to just past the boat ramp at Island Resort. The areas with the worst accumulation were the boat ramp and the area containing the Island Aqua Park play equipment. Although the accumulation levels along the shoreline varied, it appeared that the cyanobacteria didn’t extend farther into the water than 10 feet. WCHD observed a few areas of cyanobacteria suspended in the water near the shore at Rainbow Bay, but the bloom was not as pronounced as Island Resort. The screening level cyanotoxin test strip result for Island Resort on September 20, 2018, was ~5 µg/L. DWQ, CUWCD, and WCHD will conduct follow-up testing to monitor bloom activity and toxin levels at the reservoir. This sample was delivered to the lab for further analysis. 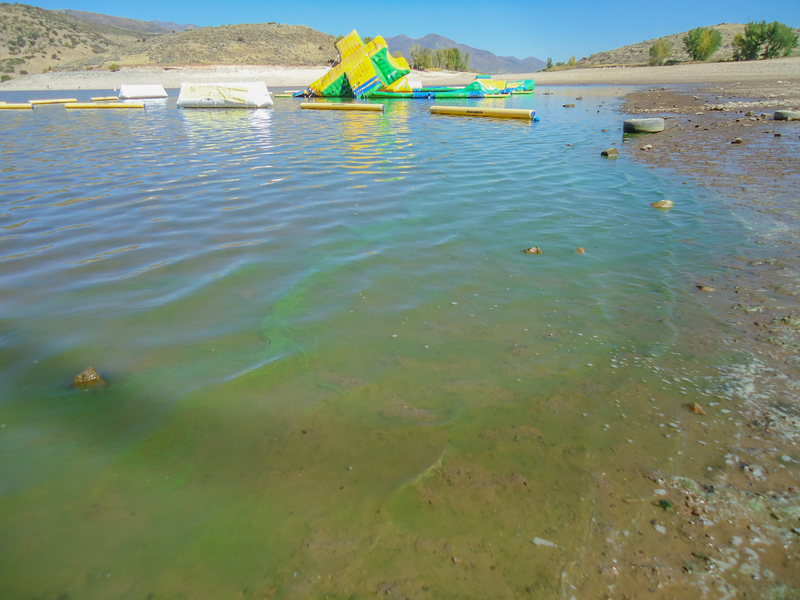 The Division of Water Quality (DWQ) visited Deer Creek Reservoir for routine E.coli sampling on September 11, 2018, and observed what appeared to be algal blooms at the Main Boat Launch, Rainbow Bay Beach, and Island Park Marina. The bloom was evident from dried algae on the shore and algae dispersed in the water column that resembled small green grass clippings. The monitoring crew observed algae in the water column at all three locations and dried algae on the shore at Rainbow Bay Beach, and Island Park Beach. DWQ collected elbow-depth integrated samples from all three locations. Toxin strip-test results were non-detect for microcystins and anatoxin-a.